Can there be beauty after fire? Definitely, if you look for it, says author Sheri McGregor. 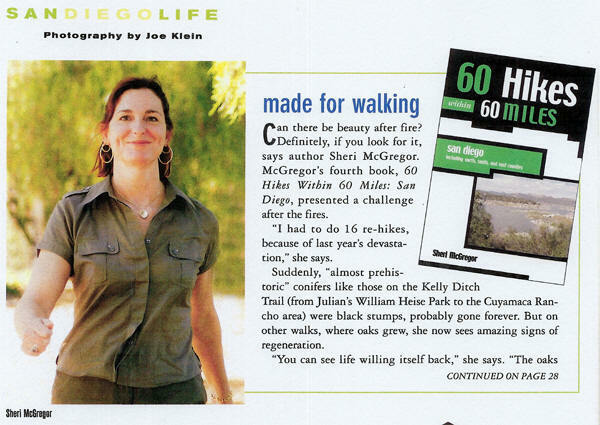 McGregor’s fourth book, 60 Hikes Within 60 Miles: San Diego, presented a challenge after the fires. “I had to do 16 re-hikes, because of last year’s devastation,” she says. Suddenly, “almost prehistoric” conifers like those on the Kelly Ditch Trail (from Julian’s William Heise Park to the Cuyamaca Rancho area) were black stumps, probably gone forever. But on other walks, where aoks grew, she now sees amazing signs of regeneration. When Menasha Ridge Press asked McGregor to do the book as part of its national series 60 Hikes Within 60 Miles, McGregor’s problem wasn’t finding 60 hikes, it was selecting from hundreds of candidate walks. “Ours is one of the most walkable counties in the nation,” she says.